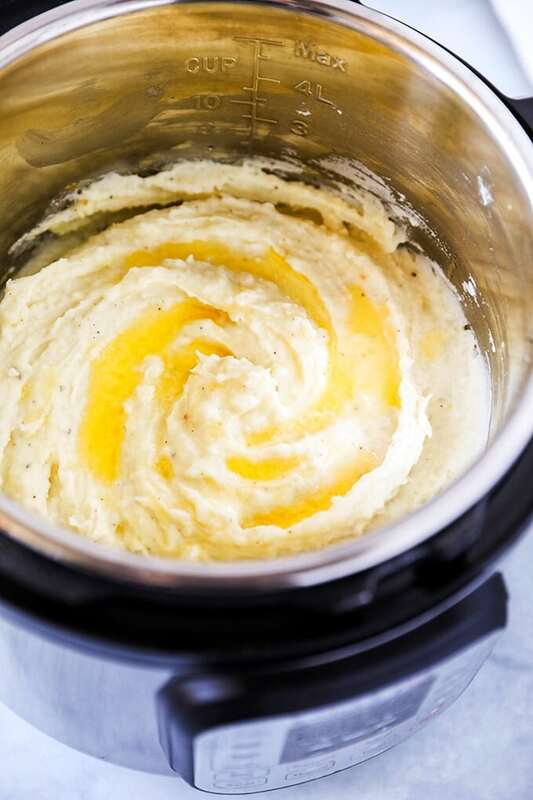 These Instant Pot Mashed Potatoes are the easiest way to make mashed potatoes! Creamy, buttery and packed with rich potato flavor. 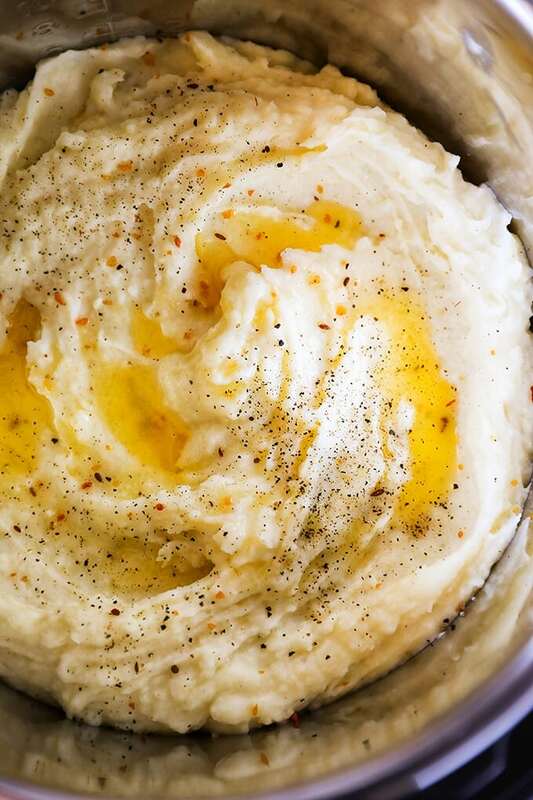 The best part of these Instant Pot Mashed Potatoes is that the Instant Pot keeps all the rustic potato flavor instead of letting it boil out like in a traditional mashed potatoes recipe. The pressure cooking seems to intensify the potato flavor. Start by buying the large russet potatoes at the grocery store. This makes for the shortest peeling time. The bulk bags of russet potatoes almost always have the smallest potatoes and will take much longer to peel. Once the potatoes are peeled, use the steaming rack included with the Instant Pot to pressure cook the potatoes. This keeps them out of the water in the Instant Pot and encourages even cooking. Once cooked, the potatoes will still hold their shape and be easily transferred to another bowl for mashing. 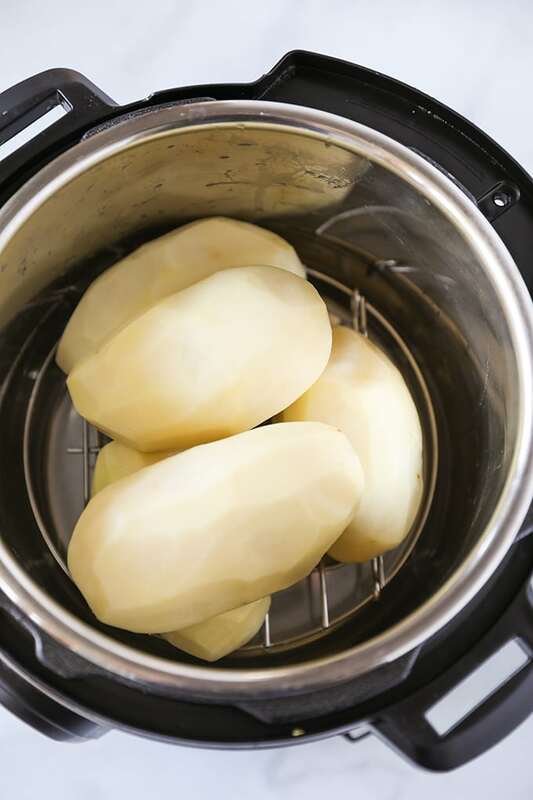 Technically, you could mash the potatoes in the Instant Pot once you have removed the steamer rack, but the scraping of metal on metal will cause quite a bit of scarring in the Instant Pot liner. If you have a non stick nylon potato masher, you could skip the extra bowl. Add water to a 6 quart Instant Pot, followed by steam rack. Stack potatoes on top of steam rack. Close and lock lid in place making sure Pressure Release Valve is set to sealing. Set Instant Pot to Manual Pressure High for 20 minutes. Instant Pot will take about 15 minutes to come to pressure then countdown from 20 minutes. Once 20 minutes is complete, do not release the Pressure Valve. Let Instant Pot Natural Pressure release. This will take about 15 minutes. Once pressure pin has dropped, remove Instant Pot lid. Using kitchen tongs, carefully remove potatoes from Instant Pot and transfer to a large mixing bowl for mashing. Using a potato masher, add salt and butter to potatoes and begin mashing. Once potatoes are mashed, stir in warm half and half. Sprinkle with freshly ground black pepper and adjust seasoning to taste. Sprinkle with fresh parsley or fresh chives before serving. 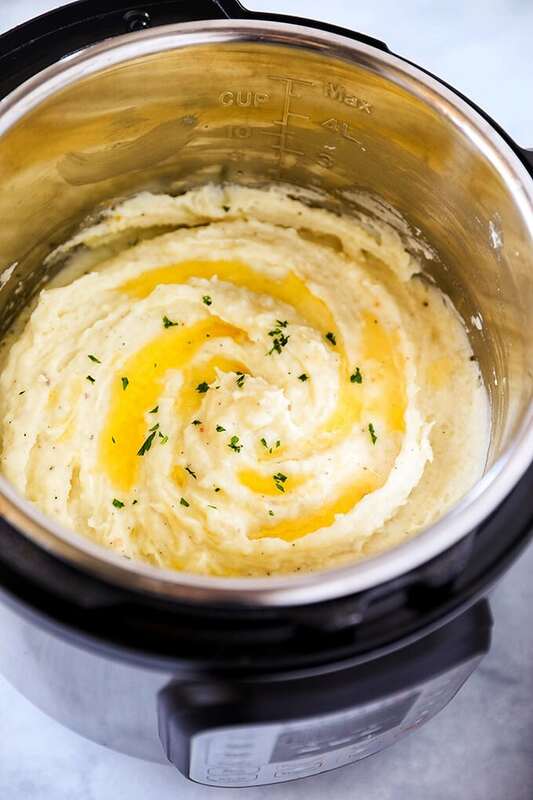 To keep Instant Pot Mashed Potatoes warm, remove steamer rack from Instant Pot, rinse stainless steel Instant Pot liner with hot water to remove leftover potato starch and dry with lint free dish towel. Return liner to Instant Pot and set to Keep Warm. Add one tablespoon of butter and let melt to coat inside of Instant Pot liner. Add mashed potatoes back into Instant Pot, top with additional butter and keep warm, stirring occasionally. If you have a nylon potato masher, you can skip transferring the potatoes to another bowl for mashing and just mash them right in the Instant Pot. 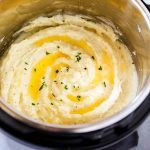 Adapted from The Kitchen Instant Pot Mashed Potatoes recipe. For an extra layer of flavor, sprinkle with coarse all-purpose steak seasoning. Nice. I like this simple recipe. Thank you!